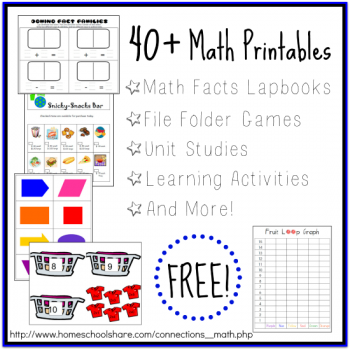 40+ Math Printables and Activities! You are here: Home / Free Printables / 40+ Math Printables and Activities! This excellent post from Homeschool Share includes links to FREE Math worksheets, lapbooks, unit studies, games, and printables! If you are planning to school all summer or just want a worksheet or activity or two per week, this list will be all that you need.